THEATRE, THEATRE, THEATRE has seriously been my life for the past week, and I am loving it! All in seven days, I went to see ‘The Curious Incident of the Dog in the Night-time’, the Marianne Elliot’s acclaimed adaptation of Mark Haddon’s best-selling novel, ‘Much Ado About Nothing’ at the Old Vic, starring James Earl Jones and Vanessa Redgrave, and ‘Blue Stockings’, the Globe’s brand new production telling the story of the first Cambridge female students who fought for the right to graduate. 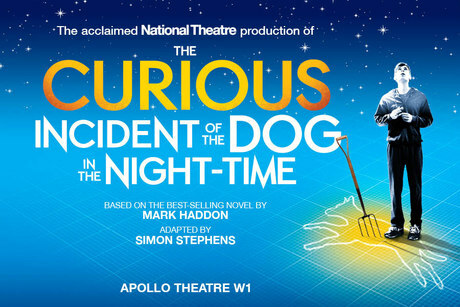 So let’s start with ‘The Curious Incident of the Dog in the Night-time’, a play which transferred from the National Theatre to the Apollo Theatre, in the West End, as a result of its astounding success. From this fact, and the various incredibly effusive reviews from critics and family alike, I arrived with pretty high expectations. And actually, despite having bought the cheapest possible tickets, and therefore being ridiculously far away from the stage (it was like I was a giraffe looking at a series of ants), I was still extremely impressed, and completely drawn into the story. The play gets better as it goes on, though from the moment the lights dim and the amazing set design illuminates, the theatre magic is truly felt. The story of Christopher, the autistic fifteen year old, and the secrets he uncovers after finding his neighbour’s dog pitch-forked (yes, pitch-forked!) in the middle of the night, is beautifully and respectfully told, just as in the novel. Unfortunately I didn’t get to see the original cast, including Luke Treadaway who won an Olivier for his enactment of Christopher, but to be honest, that mattered not a jot! I saw Mike Noble put in an incredibly realistic performance as the unlikely hero, and Trevor Fox, who I’ve seen quite a few times now, was the perfect father, trying his hardest to cope with a stressful situation. However, these are just two names out of a skilled cast of many, some of whom have hardly any lines but nonetheless transform into anyone and everyone Christopher could possibly meet on his journey. Saying this, nothing and no one can ever beat the set in this production. Bunny Christie and Finn Ross have done an exceptional job; the deceptively simple set alters over the course of the play to become incredibly complex. A train station, a tube stop, an exam hall, an entire train line, all are created before your eyes, and the lighting and sound only adds to this. What’s especially exciting is how well the way an autistic person sees and hears the world is presented; the overwhelming noise and movement of a London train station has to be dealt with by focusing solely on a red line leading to where he needs to go. Basically, this show is a Must-See. 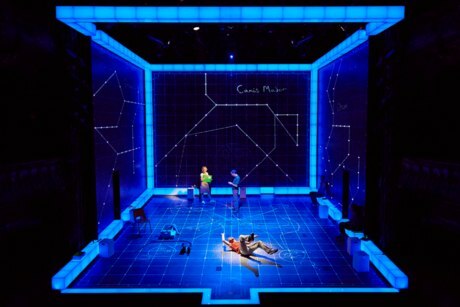 It just keeps on getting better, right up until even after the bows, when Christopher comes back on to show the solution to one of his A Level Maths problems, and in doing so uses every possible light and sound effect in the theatre. A superb play that literally ends with a bang. ‘Much Ado About Nothing’ was a completely different kettle of fish in many ways. For one thing, my friend Tara managed to get us second row of the stalls seats, so I had a much better view of the actors and the stage. For another, whilst naturally ‘Much Ado’ is a much-loved play and its stars Vanessa Redgrave and James Earl Jones are well-renowned, this production, directed by the fabulous Mark Rylance, was still in its previews, and so I don’t think it had quite reached the well-oiled, fluid pace of ‘Curious Incident’. If I’m honest, although Redgrave acted Beatrice reasonably comfortably, Jones sadly forgot his lines at one point, and even when he was acting well, his age showed; every time he came on stage a chair had to be found for him to sit on. 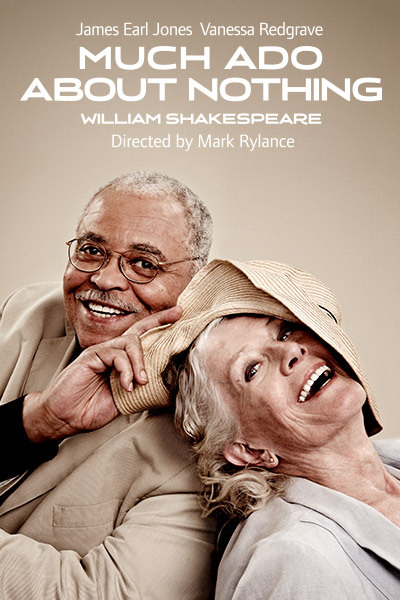 However, I think my main problem with this production was summed up in an interview with the two leads themselves; James Earl Jones said: “For Benedick, my only feeling was that here’s a guy who’s in a world where people spin language about. I thought: I bet he is not quite up to it.” I’m afraid that personally I simply don’t agree with this. For me, Benedick and Beatrice should be the quickest, wittiest characters on the stage, outstripping all their friends and relations – that’s why they’re so perfect for each other! However, that’s not to say this isn’t worth seeing; the supporting cast pick up the slack, particularly a brilliant James Garnon (a stalwart at the Globe) as Don Pedro, an incredibly, butterflies-in-your-stomach handsome Lloyd Everitt as Claudio and Peter Wight as a very successful Dogberry. The idea of using children as George Seacole and Hugh Oatcake was very clever and Kingsley Ben-Adir fully played up to the comedy of this situation. I also liked the few lines that Katherine Carlton had as Beryl, although she kind of looked as if she was on the verge of bursting into tears quite a lot of the time – maybe it was the make-up? I liked the setting of the play during WW2; the costumes were lovely. 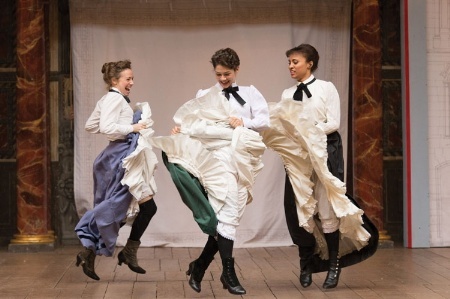 However, the scenes where Beatrice and Benedick ‘overhear’ the other’s love for each other were poorly done, gaining lots of laughter from the audience – Jones wasn’t visible for almost the entirety of his scene. We thought maybe he’d gone to sleep. Overall, a disappointing production. 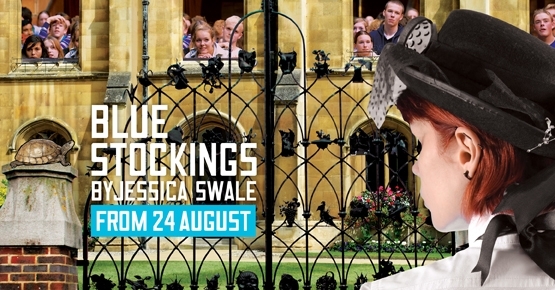 Now lastly, onto ‘Blue Stockings’, Jessica Swale’s debut play at Shakespeare’s Globe, which tells the story of female students at Girton College, Cambridge in 1989, who tried to become the first women to graduate. An interesting story, which was very well acted – I got especially excited because most of the cast are also in ‘A Midsummer Night’s Dream’ and that sort of thing makes me happy J My favourites were Fergal McElherron as Mr Banks, the principled professor and Matthew Tennyson as Edwards, and, although his character was completely horrible, Christopher Logan was superbly hateable as Lloyd. Ellie Piercy was also brilliantly vulnerable as Tess, the protagonist, although I felt the play was severely imbalanced in favour of Tess; almost everything that could have happened, happened to her. If there are four main women, give one the love affair, one the brilliant essay, one the best guy friend and one the outspokenness in a lecture, not one person all of them! Tess got every story line possible and her friends’ stories were barely developed. Another thing that sort of irritated me was the deliberate dramatic irony shoved in there willy-nilly. A note to playwrights: just because you’re writing a period drama, doesn’t mean you have to put really obvious Titanic and World War and Einstein references in there as a way to get easy laughs from the audience. Have a little more respect for your own subtlety, ok? Rant over! Apart from these small flaws, this play is definitely worth seeing, both historically and dramatically. But the biggest surprise comes at the end *SPOILER ALERT* Flags roll down telling us that women weren’t actually allowed to graduate from Cambridge until 1948. Now that is crazy. Anyway though, I agree with you that the use of the theatre was amazing and its worth seeing the production just to look at how they do so.